A new generation of designers are applying ecologically inspired design to agriculture, architecture, community planning, cities, enterprises, economics and ecosystem regeneration. Join them to co-create diverse regenerative cultures in the transition towards a regenerative society. Humanity’s impact needs to shift from degeneration to regeneration before the middle of this century. We will all have to collaborate to achieve this transformative response to the converging crises we are facing. Janine Benyus, co-founder of the Biomimicry Institute, eloquently expressed nature’s most important lesson and humanity’s main creative challenge for the 21st Century. The post-War Baby-Boomer generation was born at a time when humanity’s impact on the planet became catastrophically degenerative. The following Generations X, Y and Z were more and more confronted with results of our collective actions. We are beginning to learn the hard lesson that on an overpopulated planet, faced with multiple converging crises, even those who seem to win in the short term will lose in the mid to long term if we do not regenerate vital ecosystem functions and create conditions where all of life can thrive. No matter which generation you were born into, all generations alive today are called to join the Re-Generation. If we choose to, we can move from a zero-sum world (of winners and losers) to a non-zero-sum world where life as a whole flourishes. 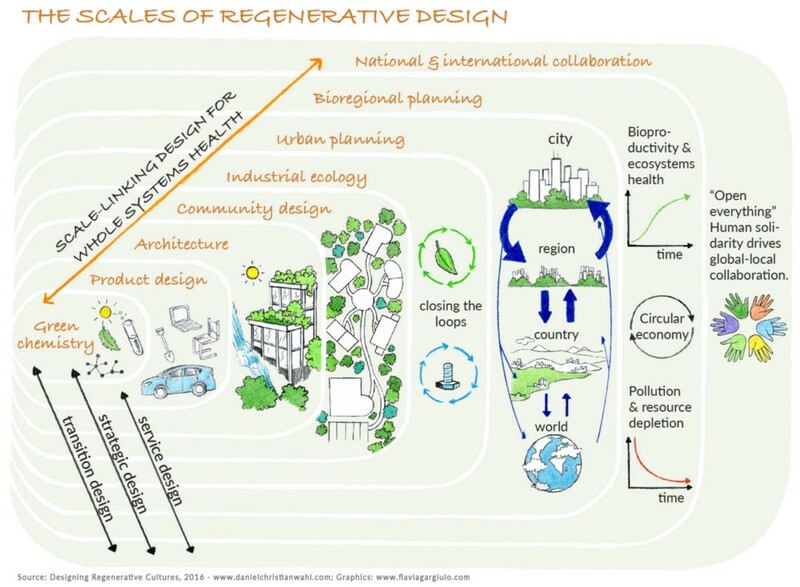 Regenerative design is about co-creating a win-win-win future where the individual, the community and the planet win; and social, ecological and economic benefits mutually reinforce each other through integrative whole systems design. Competitive advantages tend to be short-lived. We know how to create cultures based on collaborative advantage for all of humanity and the wider community of life. Many of the pioneers of the regenerative design (r)evolution are permaculture designers. Applying permaculture principles, ethics and attitudes to the redesign of the human presence on Earth offers effective strategies for the transition towards diverse regenerative cultures every-where. These cultures will be elegant expressions of the biocultural uniqueness of the places they inhabit — thriving communities in global and local collaboration. Whether ecological design, permaculture, systemic biomimicry, or regenerative design, all these approaches share a design-based methodology that applies life’s operating instructions and ecosocial literacy to co-creating a future where humanity and all of life can thrive. We are the Re-Generation! If not us, then who? If not now, then when? Here are only some of the many examples of how the intention and practice of regeneration is spreading fast and wide. Holistic land management and holistic planned grazing — developed by Allan Savory — offers tested methodologies for the regen-eration of degraded grasslands and prairies. These techniques form part of the diverse toolbox of regenerative agriculture, which PM reports on regularly. The Australian permaculture designer Darren Doherty (PM69) helped to promote this approach globally, along with organizations like the Savory Institute, the Rodale Institute and Eugenio Gras of MasHumus. Apart from the production of food and resources for regional bioeconomies, regenerative agriculture also offers an effective way to slow down climate change and eventually return to pre-industrial levels of carbon dioxide in the atmosphere. 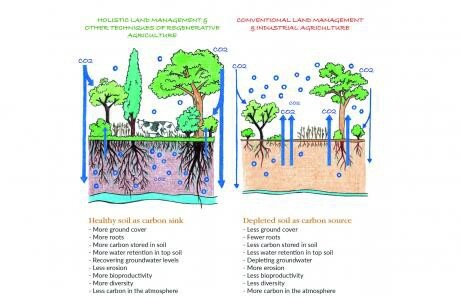 The same practices regenerate soil fertility, increase the water retention capacity of the soil, and replenish aquifers, by storing carbon under-ground in the form of organic matter and root-mass (see ‘Carbon Farming’ in PM88). There are also many hopeful examples of large-scale ecosystems regeneration. The Chinese filmmaker, John D. Liu, has documented these projects over a number of decades. China regenerated 3.5 million hectares (8.6 million acres) of heavily degraded land on the Loess Plateau in only 10 years. Similar work is happening in the Ethiopian highlands and many other places (PM86 and 87). The Scottish company Biomatrix Water is pioneering biomimicry approaches to the regeneration of polluted waterways, rivers and lakes. In the field of architecture and community design the Re-Generation also has globally recognized leaders. Inspired by the late John T. Lyle, these transformative innovators have demonstrated that buildings and communities can — by design — have a regenerative effect on place. Bill Reed co-founded the Regenesis Group and the Integrative Design Collaborative. William McDonough launched the ‘Cradle to Cradle’ approach to industrial production, which is now at the heart of the transition to circular economies (see Dame Ellen MacArthur interview in PM68). Jason McLennan has created the ‘Living Building Challenge’ and ‘Living Futures Challenge’ that have been taken up by built environment professionals around the world. We are also beginning to apply our understanding of nutrient, energy and material cycles in mature ecosystems to the redesign of cities. The World Future Council and Herbert Girardet are calling for a transition from ‘petropolis’ to ‘ecopolis’ through the creation of regenerative cities. Regenerative design is also a key component of Jon Young’s ‘eight shields’ approach to mentoring and leadership. He collaborates closely with the permaculture teachers Penny Livingston and James Stark who set up a Regenerative Design Institute in Bolinas, California. Over the last 12 years they have developed the 6.9 hectare (17 acre) site at the Commonwealth Garden into a wonderful example of regenerative design. Ethan Roland and Gregory Landua pioneered the field of financial permaculture applying the design principles to the development of regenerative enterprises. Their ‘8 Forms of Capital’ maps an economy holistically beyond just financial capital flows and reframes entrepre-neurship as a regenerative activity based on the co-creation of regenerative enterprise ecologies (PM68). John Fullerton, a member of the Club of Rome and founder of the Capital Institute, started the important conversation about what a truly regenerative economy might look like, at the local, regional and global scale. The institute’s white paper on ‘Regenerative Capitalism’ explores how an economy that functions like an ecosystem can regenerate wealth and resources in ways that serve people and planet. Last year the Centre for Planetary Culture published Towards Regenerative Society: Plan for Rapid Transition. Daniel Pinchbeck — the centre’s co-founder — is now working on a Manifesto for a Regenerative Society. My own book, Designing Regenerative Cultures, explores many more examples of how the Re-Generation is on the rise and what questions might guide us in charting our course towards a regenerative future. The false separation between nature and culture is the root cause of many of the converging crises we are facing. We have to move beyond simply learning from nature. We are capable of design as nature: maintaining ecosystem integrity, safeguarding diversity, nurturing systemic health, and strengthening the planetary life support system we depend upon! Human beings are perfectly capable of creating conditions conducive to life. The good news is that we are already doing it. There are inspiring examples ranging in scale from green chemistry, product design, sustainable architecture, community design, industrial ecology, to urban and bioregional planning, and global-local collaboration and knowledge exchange. When practicing whole systems design aimed at improving human, ecosystems and planetary health, we need to pay attention to how all these different scales of design relate to each other and practice scale-linking design to weave the synergies between them. Nature’s processes are inherently scale-linking. Regenerative cultures will be elegantly adapted to their locality and region. To achieve this everywhere we need national and global collaboration and solidarity. The health of individuals, commun-ities, ecosystems and the planet are intricately interlinked. 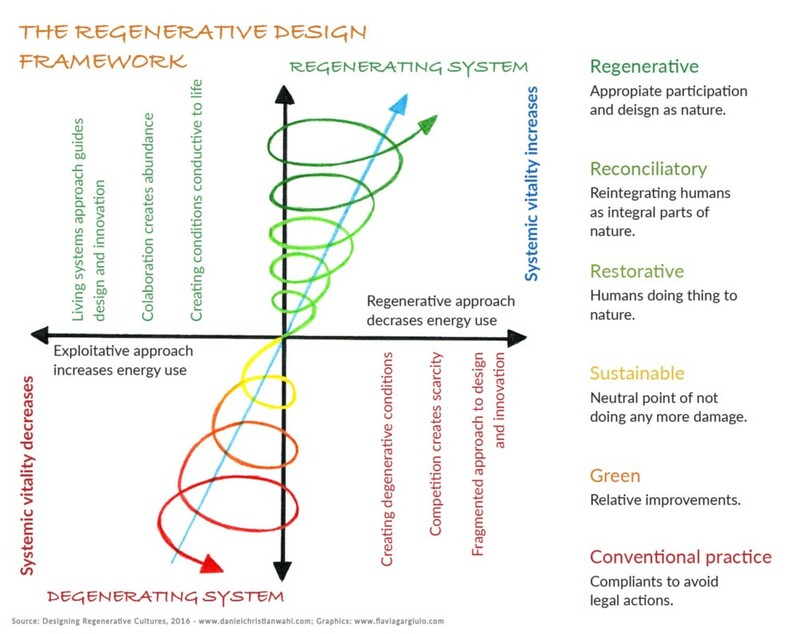 The evolutionary framework for regenerative design, created by Bill Reed, transcends and includes green, sustainable and restorative approaches as stepping-stones on our learning journey, as we explore how to live in ways that contribute to transforming humanity’s impact on Earth from being predominantly destructive to being regenerative. Business as usual falls just short of breaking the law, sticking to the limits of what is allowed — what companies can get away with in their pursuit of profit. ‘Green’ often overly celebrates small voluntary steps to do a little less damage (e.g. so-called green building or industry standards). By the time we get to sustainable practices — what Bill McDonough called 100% less bad — we are no longer adding to the destruction that we have already caused. Yet, after a few thousand years of destructive agricultural practices and a few hundred years of exploitative industrialisation, that is not enough! To create a thriving future for nine billion human beings and for all of life, we need to begin to reverse our destructive effects and start to heal communities, ecosystems and the Earth. Many, often well intended, restoration projects are still done with the arrogance of humanity as the ‘master of nature’ and we end up with projects such as planting Eucalyptus monoculture forests in already water-stressed areas and call it reforestation. We need to become humble apprentices of life. Only if we heal the entirely mind-made separation of nature and culture, only if we truly understand our interbeing with all of life, can we reconcile humanity with the rest of nature. Once we take that step — which is primarily a shift in the way we think about ourselves and our participation in life’s evolutionary journey — we can begin to design as nature by co-creating elegant solutions adapted to the biocultural uniqueness of place. Daniel Christian Wahl works internationally as an educator, activist and consultant, specialising in whole systems design and transformative innovation for regenerative cultures. He is a member of the International Futures Forum, a fellow of the RSA, and a Findhorn Foundation fellow. He co-authored all four dimensions (social, ecological, economic, worldview) of Gaia Education’s UNESCO recognised online curriculum in ‘Design for Sustainability’. Designing Regenerative Cultures, Daniel’s first book, was published by Triarchy Press in May 2016. See reviews of the author’s book: Designing Regenerative Cultures.